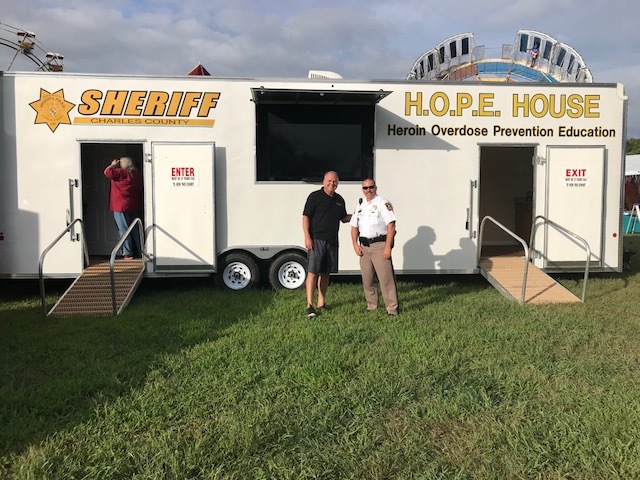 On September 12, 2018 we had the privilege to walk families through the H.O.P.E (Heroin Overdose Prevention Education) at the Charles County Fair. The Trailer is set up with a mock teenage bedroom for families to walk through and look at possible warning signs of drug abuse or use. As parents walked though there were three sheriffs from the local police present to answer questions and learn more about fielding questions with their teens. When parents walked through they became emotional as the reality hit of how normalized this issue has become. Many of the parents have teens involved in sports and the mock bedroom is clad with athletic equipment. The trailer also has photos of families who have battled first hand with the opioid crisis. A few weeks back we had a soft opening at he health department where we had former addicts walk through with their families. During the walk through they pointed out location and concealing tactics that addicts had used while struggling with their addictions. This crisis needs more education and more force to fight. At Code 3 we care for our communities and seeing change. Partnering with local police to provide you with answers you need to better assist your family. If you are interested in a walk through, we will be posting dates soon.